I have an app on my phone called 'WeddingHappy'. I downloaded it after watching this PopSugar Video on Best Wedding Planning Apps. It's not an app I use religiously but it is useful. It creates a personal timeline of tasks based on your wedding date. It has a great 'countdown to the wedding' function (which is useful for titling blog posts) and would be handy for brides-to-be on the go to keep track of supplier details and appointments. You can even add a certain number of your own tasks and deadlines on the free version. Once you've completed a task you mark it 'done' and it drops off the list. Top of its list of things I should have done by now is 'Book Florist' which is way past it's deadline and is now marked, in bright red letters as 'Complete as soon as possible'. So...I guess it's about time that I share with you some ideas we've had on flowers and foliage for our wedding. When Jim and I lived in Belfast we didn't have a garden. We did have a 'beautiful' communal alley, full of bins, which overlooked a train line but this surprisingly didn't inspire us to be particularly horticultural. We did grow a chilli plant indoors, but as we lived in an end terrace there was a ridiculous daily ritual of moving the pot from the front of the house to the back to maximise its time in the sun!! Jim has always been more interested in gardening than I have and, ever practical, he grew lots of vegetables in a local community garden - mostly potatoes and red lettuce as the slugs seem to leave those alone. Out the back of our new house in Leicester we have a little paved sun trap which means we have no excuse not to grow something! This year, alongside some particularly vigorous mint (for mojitos obviously) I planted some freesia and some gladioli. 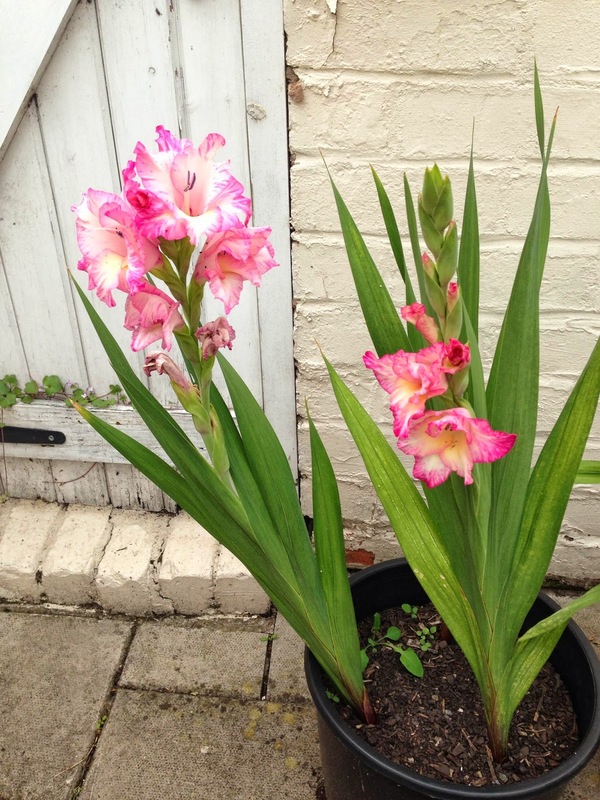 The freesias never appeared (Jim's mum informed me they are quite hard to grow) but at the end of August these beautiful pink galdioli appeared. At the weekend I spent some time weeding some of our flower beds and I've planted some heather in what I hope will become a sort of wild flower bed. With most other aspects of our wedding I feel completely comfortable but I know next to nothing about flowers and floral arranging. So although WeddingHappy (and I) felt a post on flowers was due, I have really struggled to write it. I can definitely appreciate beautiful floral arrangements and have a few favourite flowers but because we would prefer to arrange the flowers ourselves I'm searching for the right place to start. So far we think we'd like to avoid anything too formal or arranged, preferring the natural, more hand picked arrangements. I love gypsophila (Jim also likes this as he read somewhere that it is pretty cheap! ), lavender, white and green hydrangeas, and peonies. I'm really lucky to have Jim's mum to advise on what's in season and recognise all the random flowers I photograph and send to her. We like the idea of mixing potted plants in amount the arrangements and where possible sourcing in season flowers from the local area rather and than shipping in a million frozen tulips from Amsterdam. Our spare room currently houses our extensive recycled glassware collection and a few friends and family members have also started a similar collection on our behalf. We'd like to use as many recycled and upcycled pieces in our wedding decorations as possible. 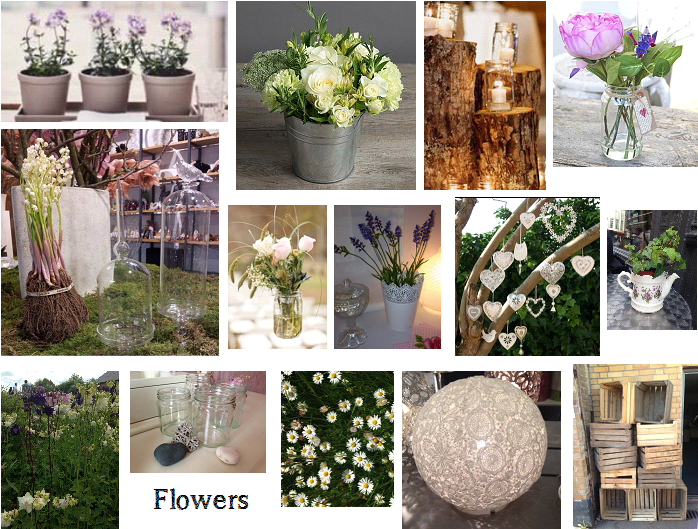 Below are some pictures from our floral mood board. So although we're not totally decided on what flowers we will, writing this post has definitely helped and has shown us that maybe, we have more of an idea of what we would like that we thought! ** some pictures my own, others from magazines or online searches.